Many people wonder if soft contact lenses must be worn a certain way. Do they have an inside out? If they are flipped the other way will they still work properly? The answer is simple; soft contacts do indeed have a front and a back and wearing them the proper way is important for optimal vision. The shape of a contact lens changes slightly when it is turned inside out. Generally the contact holds a gentle dome shape, but when inside out the contact generally peaks more in the center. This can interfere with the fit of your contact lens causing them to shift more often. Inside out lenses can also be a bit uncomfortable, feeling scratchy or blurry. Contact lenses might look like just a small piece of plastic that goes into the eye, but they are much more complex. The lens is specifically designed to improve your vision and shape is an important part of how the lens works. 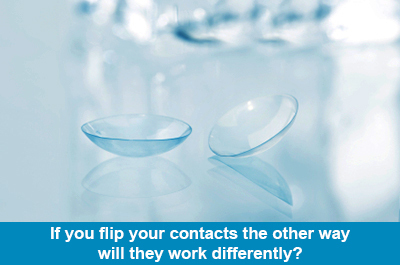 Your contact lenses are specifically designed and shaped to address the eye problems that you have. For example a person that is farsighted might need a different shaped contact lens than someone who is nearsighted. Since contacts have a different shape when turned inside out, reason holds that they will also not be able to provide the same precise vision enhancing benefits. Many people report experiencing discomfort if their contact lens is turned inside out. They may feel a slight scratching, itching or irritation. Others notice blurring or stinging. This eye discomfort isn’t just an irritation; it is a sign of a problem with your contact that needs immediate attention. Continued use of inside out contacts could potentially cause irritation in the eye, discomfort, infection and even vision problems. How can you tell if a contact is right-side out? It’s quite simple actually if you spend a few minutes inspecting your lenses before putting them in. Most contact lens manufacturers recommend a visual inspection before inserting contacts. Hold the lens on your fingertips and look at the lens closely. Do you see any irregularities or problems? Look for scratches, tears and deformities. Also look closely at the shape of the lens. Does it look normal? The contact lens should be shaped like a bowl. If the edges of the lens is flared out, then your lens is inside out. As you become familiar with the particular type of contacts you wear it will be easier to notice problems with your lens. If you’re still unsure whether your contact lens is right-side out, you can perform a test that is known as the “taco test”. This simple test is a great way to determine if a contact lens is inside out. Simply pinch the edges of the lens applying slight pressure. If the contact folds like a taco then the lens is positioned correctly. If not, it may be inside out. While it is important to ensure that you wear your contact lenses properly, it is equally important to make sure they are cleaned properly before each insertion. Your eye doctor will be able to inform you of the best method to use when cleaning your contact lenses. Always use a contact solution specifically designed for the type of contacts you wear and always follow product instructions. Taking care of your contacts when you take them out will help you to always know they are safe to insert and will help you to avoid inside out contacts. Wearing contact lenses properly is essential for protecting your eyes and receiving the optimal visions enhancing benefits. If you’re worried that you might be wearing your contact lenses the wrong way, talk with your eye doctor. Find out how to best wear and store your lenses to ensure they are the right direction every time.